RS Components has introduced the Intel Movidius Neural Compute Stick (NCS), the newest development tool for ultra-low-power deep-learning inference. The tool enables developers to develop and prototype artificial intelligence (AI) applications to a broad range of devices at the edge in a convenient USB form factor. Targeting developers, corporate R&D and academic researchers working in machine-learning and data-science applications, the NCS integrates the Movidius Vision Processing Unit (VPU), which offers best-in-class power efficiency and is capable of running high-performance floating-point convolutional neural networks (CNNs). Supporting the popular deep neural network (DNN) framework, the stick is ideal for use as a development tool for neural network prototyping and acceleration. The USB-form-factor inference engine enables developers and researchers to free their projects from the cloud and allow them to learn quickly about the performance and accuracy of their neural network applications running in the real world. 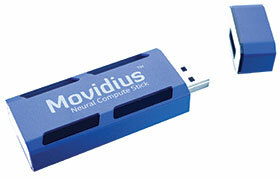 Neural network projects can be quickly ported via the Movidius Neural Compute Compiler to run real-time deep-learning inference on the compact USB stick. Enabling the acceleration of existing compute-constrained platforms, the NCS enables deep-learning R&D and prototyping on a Linux laptop or any x86-based host device. In addition, the Neural Compute Platform API allows user applications to run on an embedded host, which can initialise the target platform, load a graph file and offload inferences. Support for the NCS will also be extended in the future to include other platforms, such as the Raspberry Pi. The complete list of software tools available in the Movidius Neural Compute Software Development Kit includes the Movidius Neural Compute toolkit and the Movidius Neural Compute API. These tools are available online on the developer.movidius.com website. The role of lasers in the Fourth Industrial Revolution.